As I’m sure you noticed, Australia changed its Prime Minister again recently. We’ve churned through rather a lot of them recently. Anyway, the new Prime Minister, Scott Morrison, is an active church-going Pentecostal Christian, and this has caused significant excitement in some sectors of the Church. He is certainly the first Pentecostal to serve as Prime Minister of Australia, and I think he is probably the first from any of the free-church traditions, which is a sector of the wider church that includes us. My main fears are based on his time as Minister for Immigration. The “stop the boats” slogan was one of his signature pieces. He was the public face and custodian of the government’s cynical and callous treatment of refugees and asylum seekers. He was responsible for policies that saw men, women and children locked up in concentration camps on remote islands. He defended measures which reduce their access to legal services, healthcare, the media, and public awareness. His public statements appealed, not to our love of neighbour, not to our generosity of spirit and sense of a fair go, but to our selfishness, our small mindedness, and our fear of difference. And in case you think I’m making partisan political statements, the attitude and policies of the Opposition are roughly the same and equally odious. In thinking about Scott Morrison’s record as Minister for Immigration, it is hard not to be reminded of one of his predecessors, Philip Ruddock, whose time in that portfolio reduced him to one of the most pitiful figures in Australian politics. One of the most daunting things about committing yourself to following Jesus is that it is all or nothing. Jesus does not give us the option of choosing to commit some parts of our lives to him and continuing to pursue other agendas and dreams in other areas of our lives. It is not uncommon to find people trying though, and given that the words of both James and Jesus seem to be addressing just such an attempt, we can safely assume that people have been trying it from the beginning. Now I’m not trying to tell the government how to run the country. We live in a secular nation and we Christians have no more right than any other minority group to expect the country to be run according to our values. But just as we have the right and responsibility to stir one another on to a fuller discipleship, so too when our politicians claim to share our commitment to Jesus, we have the right and responsibility to hold them to account for the integrity with which they live that out in their private and public lives. But we’d be missing the point if we focussed on the implications for our politicians and neglected to take a good hard look at ourselves. Scott Morrison and Philip Ruddock stand as examples of the challenges that face us all in seeking to live out the implications of our commitment to Christ with our whole hearts and minds. Some of our forebears in the radical reformation looked at these sort of things and concluded that it was not possible for a follower of Jesus to serve as a politician because the conflicts were irreconcilable. So I understand something of how difficult that conflict must be for Scott Morrison and Philip Ruddock. Perhaps they’re not that different from Peter in tonight’s gospel reading. With one breath he names Jesus as God’s anointed one, but with the next he wants to cling to his previous political agenda. He wants a Messiah who will kick out the Romans and establish Israel’s political supremacy and its right to dictate who will and won’t live within its borders. He wants a Jewish supremacist Messiah, not a suffering Messiah. He wants to align himself with Jesus, but he doesn’t want to accept what Jesus says that is going to mean. But Jesus will not let him pick and choose. It is all or nothing. To espouse one thing and continue to work for the other is described as satanic. In our baptism, we committed ourselves to doing just that. We renounced selfish living, loveless desires, and all that is false and unjust, and we followed Jesus into the deep waters, binding ourselves to him and pledging ourselves to trust in him alone. When we rose with him from the waters, we were anointed like royalty. 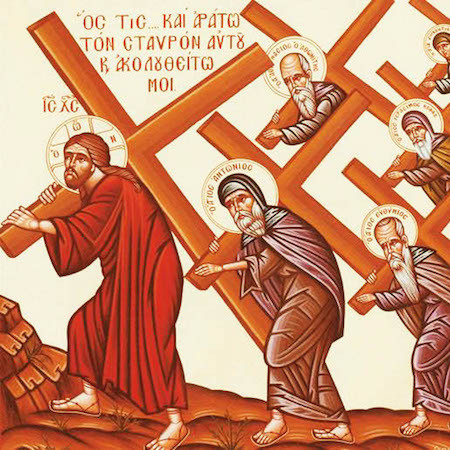 But in what must seem to the world like a contradiction in terms, our royal anointing was with the sign of the cross, marking us forever more as those who have died to the world and who offer ourselves, with Jesus, in suffering love for the world. And as we gather week by week to receive the gifts of the broken and self-offering Jesus, so we are called week by week to continue to follow him in that same spirit, giving ourselves for Jesus and for the broken and suffering ones with whom he has identified himself. And that means giving ourselves in ways that cost us the right to continue pursuing the dreams of comfort, security and independence that we grew up with and imbibed unthinkingly from the society around us. No longer can we defend our own comforts and security if it means shutting the door to the homeless, the needy, the refugees. No longer can we claim special privileges on the grounds that we were born on one side of a border and not the other. We have given our allegiance to one whose claim on us is higher than that of national sovereignty or economic prosperity. Nowadays I am painfully aware of this clash of allegiances whenever I am overseas. When I was younger, I had always assumed that when I got to travel overseas, I would do so as one who was proud to be an Australian. I would be proud to be a representative of a country which has increasingly transcended the racism and imperialism of its past and become of beacon of egalitarianism, a fair go for all, and a willingness to make space in our hearts and communities for the dispossessed and outcast from beyond our shores. But, while there are certainly still things about this country which I love and cherish, I don’t land on foreign shores as one who is proud of what my country presently stands for. Instead I feel painfully out of step with the way my country has decided to barricade itself against the rest of the world. And it forces me to confront the clash between my identity as an Australian, and my identity as a follower of Jesus. It forces me to deal with the reality that when the aspirations of my country are manifestly at odds with the values of the suffering Messiah I am following, I have to stand for the gospel and against the self-interest of my country. That means that even if I were to concede that an open door policy to refugees was against the best interests of this country, I would have to advocate opening the door anyway, because seeking to advance the interests of my country at the expense of the interests of humanity and the planet in general is one of the aspirations I have been called to deny myself in order to follow Jesus. And as painful and challenging as that call is, it comes with the promise that those who give up their life for the sake of Jesus and for the sake of his gospel will receive life in all its fullness, life richer than mind can measure. When we let go of the things that keep us anchored to the ways of our past and bound to the ways of the world, we are able to surrender ourselves to the love of God in Christ, and we are able to be swept up by the Holy Spirit into the glory of God, into the passionate dance of love that is the life of God. The spirit of celebration and hope in our gathering here tonight is but the first fruits of the joy to come. We who have taken up the cross, surrendered our rights as individuals and citizens, and died with Christ, are being raised with him into the promised land of love and joy and freedom where all God’s people will be one; where the former refugees and the former nationalists will sit down in peace to share together at the Messiah’s great banquet to celebrate the final defeat of the forces of hostility, suspicion and death at the hands of the suffering love of Jesus, to whom be the glory forever.